Click here for assignments folder! I had the privilege of interviewing Lori Moore, a fellow co-worker in residence life and my friend and colleague Stenway Louve. Since my theme centered around thinking about persisting when faced with challenges, I wanted to interview individuals who I knew had experienced some level of hardship. 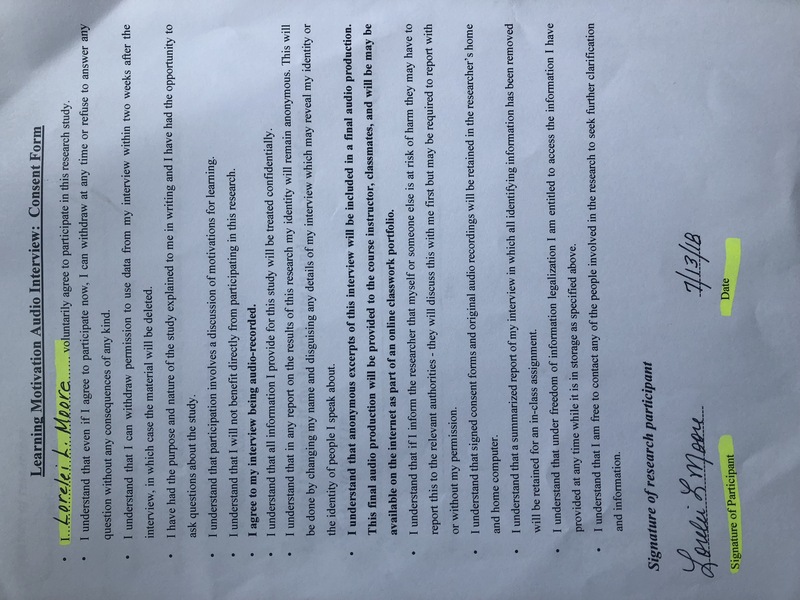 I found it difficult to not preemptively draw a conclusion before conducting the interviews, but instead to allow the information to come together the best it could. I found that starting the recording before we began officially asking questions was helpful so that the interviewee was more relaxed. I left both interviews feeling inspired by their stories and even more curious. I felt as though the recording and editing technology allowed me to reflect more deeply about the content I had just heard, because I listened to it over and over and had to synthesize the information. It also would have been more difficult to find similarities and differences between the two interviews without having the audio files. It presented the information precisely which was important in order make accurate conclusions. If I had just taken notes, the tone, emphasis, and exact wording would have been missed, and a written report could not have captured the joy it was to listen to others talk about what motivates them and how they had overcome situations. 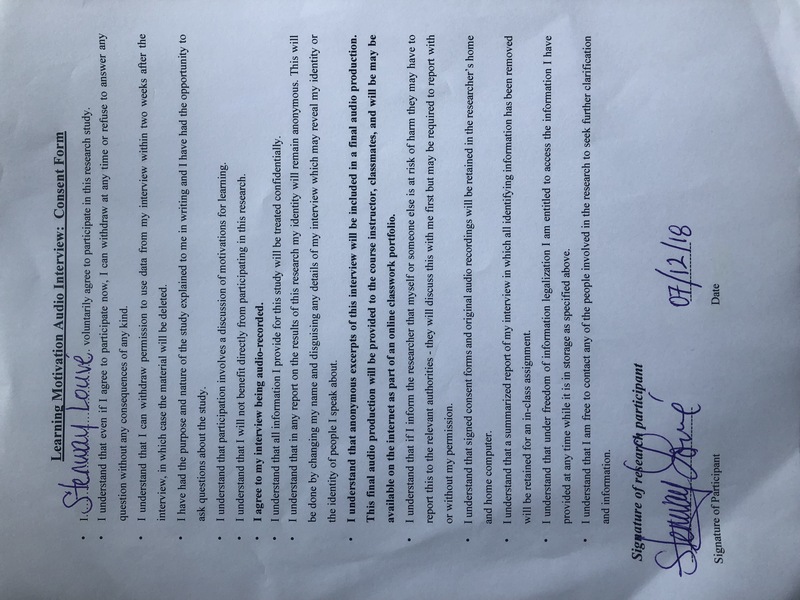 **Interviews were conducted on 7/12/18. The interview consent forms can be found here and here. ***Tech details – recorded using Snowball Blue Classic Microphone and Audacity Software. Edited on a Macbook Air. ​Creating this digital storytelling project was meaningful due to the reflection required to communicate my interests, why they are important, and where they originated. I decided to write and record the copy first, making sure it was under five minutes, then add my own pictures and stock photos that help to tell the story. Initially, I only had music at the beginning and end of the story, but later decided to add instrumental music under the whole project. Adding the music throughout made the story feel more cohesive to me. I used Audacity to record my narrative, then transferred that and the photos to iMovie. It is not as intuitive as I felt like Audacity was, but it did accomplish the task. I learned that it was important to finalize the content prior to storyboarding the pictures because they pictures were simply there to bring the narrative to life. It was hard not to make the story look too cheesy because of the stock photos, but my hope was for it to almost feel like a picture book. If this project were replaced with a written report, I feel as though the emotion or passion that is heard in one’s voice or doubly emphasized through photos would be missed. Technology has a way of involving more of your senses, which I believe ends up capturing more of your emotions. There is a greater connection that can be made with the content through the multimedia means of communication.